The Believers ~ The Believers were originally James Brown’s backing band, the JB’s. When King Records decided they only wanted to release tracks by James Brown, not his band, Brown teamed with Floridian music mogul Henry Stone to create the BrownStone Label. Additional tracks were released on the label by Bobby Byrd, Vicki Anderson and others, but this track is the hardest and rarest. Charles Johnson ~ This Alston track, Baby I Cried Cried Cried, the rarest 45 by Charles Johnson, is one of the best soul singles of the 70s. Clarence Reid ~ Clarence Reid, singer, songwriter, talent scout, and producer for Henry Stone’s labels, was involved in just about every recording that came out of Stone’s Hialeah-based Upstairs studio. This is one of the funkiest grooves ever from Reid, a hard and heavy number. George & Gwen McCrae ~ McCrae formed his own singing group, the Jivin’ Jets, before joining the U.S. Navy in 1963. Four years later, he reformed the group, with his wife Gwen joining the line-up, but soon afterwards they decided to work as a duo. George & Gwen were discovered in 1967 by singer Betty Wright, who helped get them signed to Stone’s Alston record label. Gwen McCrae ~ Gwen McCrae, best known for her 1975 hit Rockin’ Chair, hails originally from Pensacola, Florida. After recording with her husband George, Gwen then won a solo contract for Henry Stone’s Alston label. George also went on to fame singing Rock Your Baby. Jerry Washington ~ Jerry Washington’s 70s boogie club soul tune Don’t Waste My Time, originally on the Glades label, brings a tight groove and bass to Jerry’s improvised vocals backed by heavy drums. Milton Wright ~ The brother of soul singer Betty Wright (of Clean-Up Woman fame), Milton has a more jazzy sound than many of his contemporaries. He brings his own acoustic guitar lines to the funky keyboards and rhythms. Phillip Wright ~ Another brother of Betty Wright, brings this excellent funk from the Miami scene of the 70s, Keep Her Happy is an original number from Wright, with riffing guitar underneath strong horns, and a little bit of spicy keyboards on the breakdown with warmvocals over a classic funky groove. Arnold Albury & The Casuals ~ Born 1940, Arnold “Hoss” Albury played keyboards and was an organist for the world-famous Marching 100 Band out of Miami. Arnold was a founding member of the group The Rising Sun, and recorded on three Dade 45s. Wizdom ~ A great rare soul track with a sweet and soulful groove from the 1980s. Wizdom featured Anthony “Tony” Ward as the energetic lead guitarist and Walt Harris on lead vocals and drums. Fats Gallon ~ Gallon played drums for legendary top entertainers such The Dell’s, Manhattan’s, Sly Stone, ChiLites, Latimore, Regina Bell, Betty Wright, and Millie Jackson. Amazing is the best adjective to qualify these tracks; soul, funk, p-funk and psyche are mixed and the mood is quite crazy. 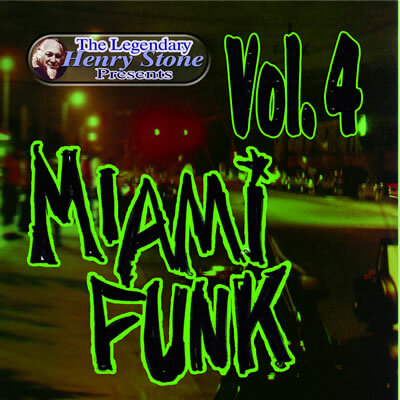 Chocolateclay ~Great Miami style Funk from the collaboration of George “Chocolate” Perry and Clay Cropper. BONUS Gwen McCrae ~ These two bonus tracks are fantastic renditions of these popular Stevie Wonder songs, You Are The Sunshine of My Life and Signed, Sealed, Delivered with Gwen’s signature sultry vocals.